Fueling kids for success in the classroom. Our food choices for our children set the stage for their entire day. Are you filling their tanks with foods that provide brain fuel or are you settling for a diet that negatively affects children’s attention spans, memory and ultimately their grades? Consider a common breakfast of sugary cereal, a doughnut or a toaster pastry, all of which consist mostly of simple carbohydrates. When your child eats a serving or two of such choices, that sugar gets rapidly absorbed into the bloodstream. Then off a child rushes to school with a jolt of energy. The sugar buzz especially kicks in about the time the child arrives at school, often making the youngster talkative and fidgety for the first lesson. About an hour later, the child’s blood sugar starts to drop, leaving him feeling sluggish. With the dropping blood sugar, the body starts to secrete adrenaline into the system in an attempt to keep the blood sugar up. This makes the child bawdy and jittery. His brain becomes foggy and his attention plummets. Just when the child’s sugar is about to reach its lowest, along comes snack time. And what does the child crave? More sugar. Down goes the crackers or cookies that send the blood sugar sky high again and set off the roller coaster for another ride. These are not ideal conditions for the learning process. Sound familiar? Let’s go back and give your child a better start. Wake your child 10 minutes earlier than you usually do. After he gets dressed, your child could go outside for a 10-minute activity period. This might entail walking the dog, jumping on a trampoline or doing another brief exercise that gives your child a vital jump-start to his metabolism and mental functioning. Meanwhile, you prepare a brainy breakfast like French toast topped with fruit or a veggie omelet served with fruit and yogurt. On-the-go options include an egg sandwich on a whole-wheat English muffin or low-fat cheese melted on toast with a piece of fruit. The meal can be anything with a good source of protein, complex carbohydrates like whole grains and healthy fats. Now that your child is fueling his body with slow releasing energy (the protein and/or healthy fats slow down the absorption of carbohydrates into the bloodstream), he heads to school with stable energy levels and blood sugar to last all morning. The same principles apply to lunch. To get kids to bring a healthy lunch to school, involve them in picking the menu, shopping for ingredients and building the meal. They are more likely to eat it this way. Review the menu every month and pick five sandwiches, five snacks and five types of finger veggies. This becomes the building block for each day’s lunch. Lunch always includes a small bottle of water and maybe a 100-percent fruit juice once a week as a treat. A suggestions for a brain-healthy lunch would be a tuna sandwich on whole-wheat bread with lettuce, tomato and a low-fat mayonnaise made with canola oil, along with carrot sticks with hummus dip, a piece of fruit and a glass of milk. Michelle Obama’s guidelines that call for meals with less sodium, more whole grains, and a wider selection of fruits and vegetables are a step in the right direction. You can improve things further by making lunches yourself. The brain is the most metabolically active organ in the body. What you eat has a profound effect on how well your brain thinks, pays attention, remembers and reacts. The most important group of nutrients for the brain is omega-3 fatty acids. 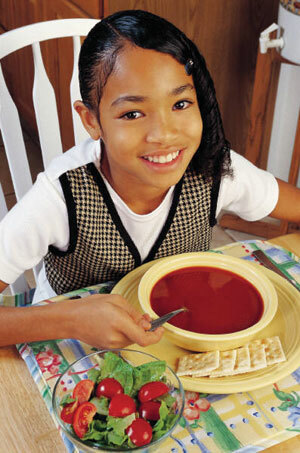 Children with ADD and other learning or behavior problems generally have the lowest blood levels of omega-3s. Similarly, kids tend to show significant improvement in their learning and/or behavior after starting an omega-3 fish oil supplement. I generally give between 500 and 1000mg of DHA/EPA, which are the most important of the omega-3 fatty acids. I give my kids these at breakfast, because this tends to be the easiest time to remember to do it. Or you could serve 12 ounces of cold-water fish, such as salmon, per week. But your kids will likely stomach the supplement better, and you’ll all be pleased with the results. Dr. James (Jim) Sears is an Emmy-nominated co-host of the award-winning talk show The Doctors. The board-certified pediatrician is also part of a family practice that he shares with his father and brother in Capistrano Beach, California. Dr. Sears has co-authored several books, including The Healthiest Kid in the Neighborhood, the bestseller The Baby Book and the newly released The Omega-3 Effect: Everything You Need to Know About the Supernutrient for Living Longer, Happier, and Healthier, all published by Little, Brown and Company.